Doors open at 6.00pm and the event, which is proudly sponsored by Adore Jewellery and New Star Kebabs, runs till late. Entrance is from 150AUD per person including full meze and beverages. Those wanting to get close to the action can indulge in Diamond VIP (SOLD OUT!!) seats by the stage priced at 225AUD. The famous singer became an instant hit in Turkey with her debut release in 1981 Kimbilir and has gone on to release a further 31 albums. 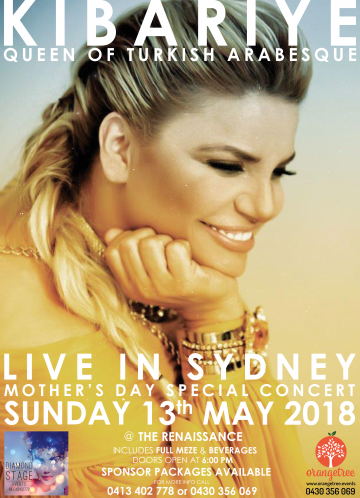 With a distinctive smoky voice and her repertoire comprising a popular mix of classic Arabesque and modern Turkish Pop songs, she continues to enjoy a huge fan base in and outside of Turkey.